Temperatures in northwest routinely reach the upper 90°’s and low 100°’s during the sunny days of summer. 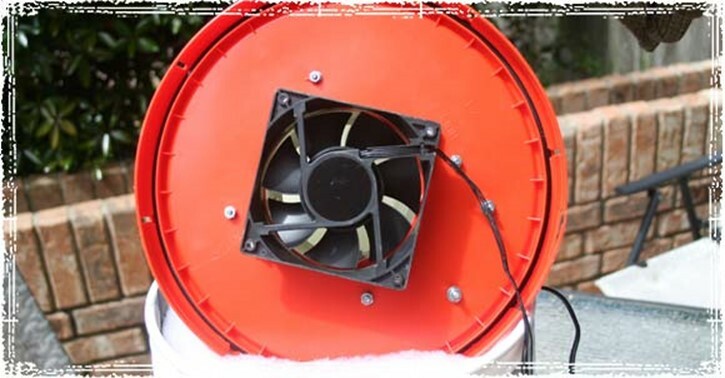 I’ve long been a fan of using solar energy to cook and power some of our phones and radios so I decided to research and build a small evaporation cooler for camping, work, and around the house that will also run off solar power. 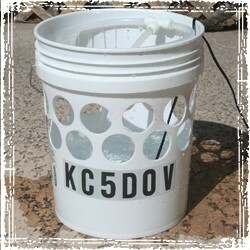 I began with a white 5 gallon bucket and lid from Home Depot. Two rows of 12 – 2 1/8″ holes were drilled in the bucket and the plastic burrs around each hole were removed. The holes are drilled around the top, leaving the bottom free for holding water. 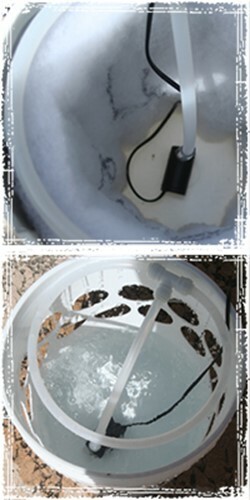 At the top, a T-connector was installed and a loop of tubing was measured and connected to the T. In the circle of tubing connected to the T, 3/32′ holes were drilled through the underside approximately every ¾” – 1″ for water to flow down the filter.The screen and filter were removed and approximately 2 ½ gallons of water was poured into the bucket and the pump tested. A hole, corresponding to inside diameter of the large end of the 90° PVC was cut into the lid. 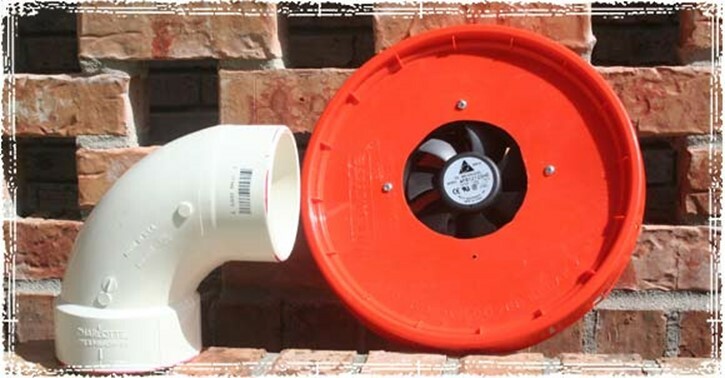 The fan was centered over the hole and connected to the lid with 4 – #6 screws, washers, and nuts. 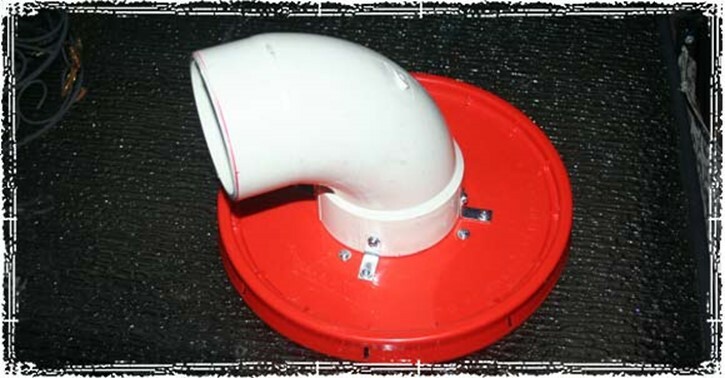 The 90° PVC was connected to the lid Using 4 – 1″ L Brackets, screws, washers, lock washers, and nuts. 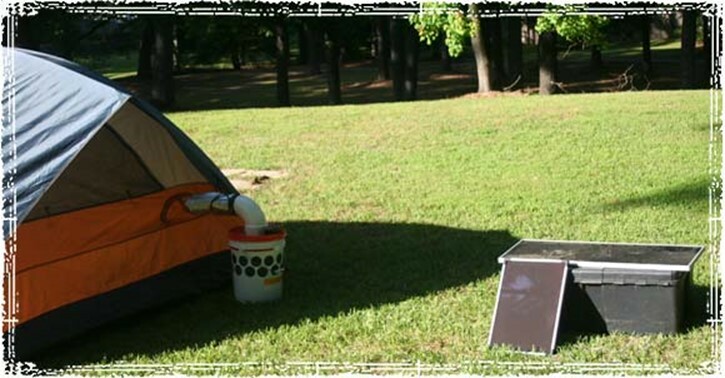 A bead of GOOP put between the lid and PVC 90°, sealing it from any leakage of air. A dab of GOOP was also put on each screw and nut on the bottom of the lid to prevent them from loosening from the slight vibration of the pump and fan. On the lid of the plastic Project Box, two equally spaced and centered holes were drilled for the switches (I used 2 with on-off tags). I spent two or three nights reading, watching videos, thinking about how to make a cooler, and a little over 3 nights building and testing. Since the cooler will be used on a daily basis in the summer in my truck (for work), camping, and poolside, I decided to beef-up some areas. The 90° PVC fitting was connected with “L” brackets and sealed with GOOP glue insuring now air leaks around the nozzle. All connections were soldered and taped with a quality electrical tape. The taped splices with be re-soldered in the future and heat shrink tubing with be installed on the slices. The holes in the project box were sealed with the GOOP Glue. 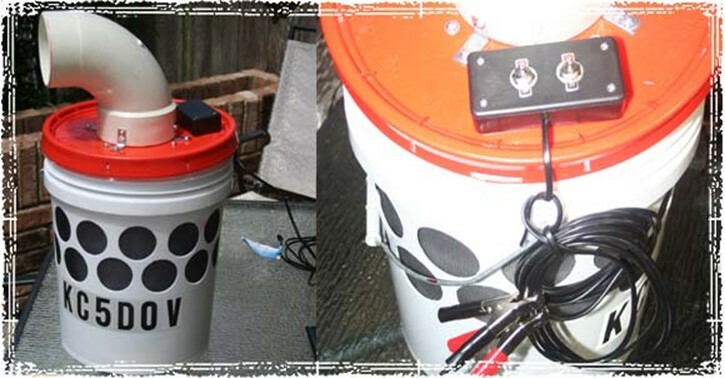 And don’t forget there are 24 – 2″ or larger holes in the top of the bucket so it has lost a lot of structural strength and will not hold up much weight bearing down on the lid. 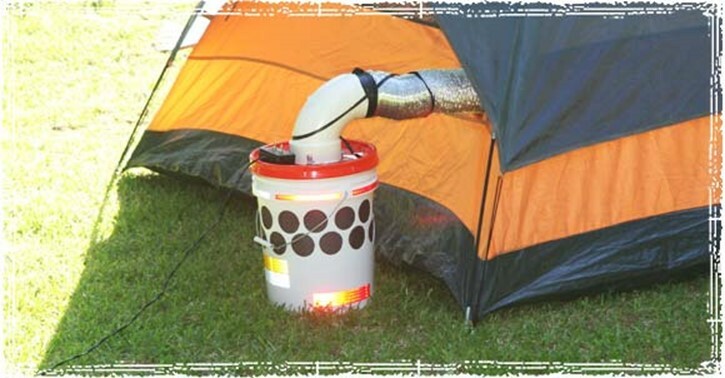 This is an excellent evaporation cooler, just be sure to put both the cooler and the solar panel in direct sunlight. Sunshine is needed to evaporate the water in the cooler and make the air cool. We used a 1-liter Dr. Pepper bottle that was filled with H2O and frozen It helped cool the air. We did learn that the higher the humidity, the less cooling effect it has on the air. Back in the 1800,s Folks would cool there cabins by putting up cheese cloth over there windows with a flower box under the window filled with water and the bottom of the chesse cloth would be in the water. As the wind blew the wet cheese cloth nailed to each window would cool the air inside and being cheese cloth they could still see out.